The Virginia Sports Hall of Fame is proud to welcome two local baseball legends to Zeiders American Dream Theater in Virginia Beach. 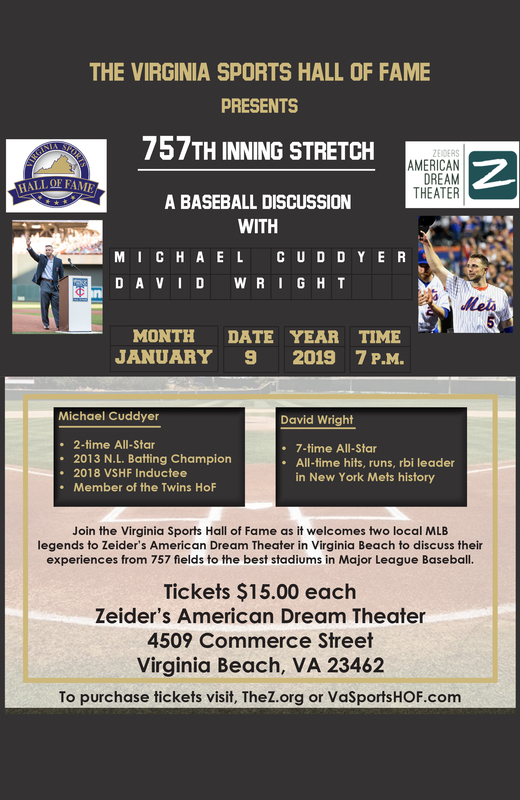 Join us on Wednesday, January 9th, 2019 for 757th Inning Stretch, featuring Michael Cuddyer and David Wright. Cuddyer and Wright will share their experiences in baseball, from the little league fields in Chesapeake to the best stadiums in Major League Baseball. Don’t miss your chance to participate in this great baseball event. All ages are welcome to attend. Tickets to the event are just $15! Michael Cuddyer – a native of Chesapeake, and a graduate of Great Bridge High School, Cuddyer would play fifteen seasons in the major leagues for Minnesota, Colorado and the NY Mets, winning a batting title for Colorado in 2013, was twice named to the All Star team and is a member of the Twins’ Hall of Fame. David Wright – a native of Chesapeake, and graduate of Hickory High School, Wright would spend his entire career with the team that drafted him, the New York Mets. Wright, a 7-time All-Star retired from the Mets following the 2018 season, as the organization’s all-time leader in hits, runs scored, rbi, total bases, and doubles.